english name "Cecilia's Ringless Amanita"
intro The macroscopic description is based on the original description of Berkeley and Broome (1854). cap The cap is 75 - 110± mm wide, brownish yellow at first, losing all yellow tints at maturity and becoming a sordid brown, subellipsoid at first, later campanulate, and often decorated with dark gray to blackish gray volval remnants. The cap's margin is distinctly striate. gills The gills' are distinctly free at first and tend to become remote; they are sometimes forked or grown together in places. The short gills are abruptly truncate. stem The stem 100 - 160± × 15± - 19± mm, whitish and narrowing upward. It is decorated with one or more rings of dark volval material (with its coloring changing as it does on the cap). The stem is not firmly stuffed and is often at least partially hollow. There is no ring on the stem. The remains of the volva on the stem's base usually take the form of a short, pallid, cup-like structure. odor/taste The original description of this species states that it lacks an odor and has a sweet taste. 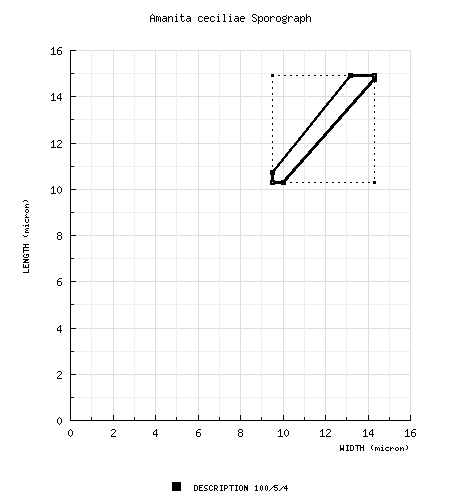 spores Spores measure (9.5-) 10.3 - 14.9 (-25) × (8.6-) 9.5 - 14.3 (-25) m and are inamyloid and globose to subglobose (rarely broadly ellipsoid). A few "giant" spores are commonly found in a mount of gill tissue. Clamps are not found at bases of basidia. discussion Amanita ceciliae is a European species that is incorrectly reported from many places throughout the world. In young material such as that depicted above, the cap is brown over the center and brassy elsewhere. Eventually, the cap becomes entirely brown. The species is also known by the name A. inaurata Secr. ex Gillet, a later synonym. Fries used the name A. strangulata for this species, but his original description of A. strangulata states that it is a white species. According to Bas (1984), the Friesian name should be discarded as of unknown meaning. The Colombian and Mesoamerican species known as "ceciliae" or "inaurata" is A. sororcula Tulloss, Ovrebo & Halling. The North American taxa known under the above two names are several and, as yet, undescribed. author (Berk. & Broome) Bas. 1984. Persoonia 12: 192. ≡Agaricus ceciliae Berk. & Broome. 1854. Ann. Mag. Nat. Hist., Ser. 2 13: 396. =Amanita inaurata Secr. ex Gillet. 1874. Champ. (Hyménomyc.) Croiss. France: 41. ≡Amanitopsis inaurata (Secr. ex Gillet) Fay. 1889. Ann. Sci. Nat., Bot., Sér. 7 9: 317. ≡Amanitopsis vaginata var. inaurata (Secr. ex Gillet) Sacc. 1915. Fl. Ital. Cryptogr. 1(14): 62. ≡Amanita vaginata f. inaurata (Secr. ex Gillet) Veselý. 1933. Ann. Mycol. 31(4): 280. 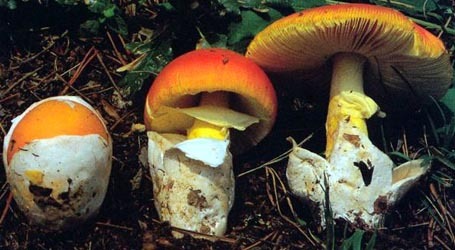 =[Amanita] "Amanitopsis" inaurata f. royeri L. Maire in E.-J. Gilbert. 1918. Gen. Amanita Pers. : 155. ≡Amanita vaginata f. royeri (L. Maire in E.-J. Gilbert) Veselý. 1933. Ann. Mycol. 31(4): 280.
non Agaricus (Amanita) var. strangulatus Fr. 1838. Epicr. : 6.
etymology genitive of a name (Cecilia); hence "of Cecilia" or "Cecilia's". Named for Cecilia Berkeley—reportedly, one of Berkeley's daughters. selected illustrations Romagnesi. 1961. Nouv. Atl. Champ. 3: pl. 179. Olive text indicates a specimen that has not been thoroughly examined; for example, for microscopic details or another spot where data is missing; for example, a place name. The microscopic data and information derived from macroscopic review of exsiccata derives from original research of R. E. Tulloss. "Pileo primum semielliptico, volva murina crassiuscula rimosa, demum basi irregulariter circumscissa marginata operto, dein campanulato; margine sulcato; stipite sursum attenuato spongioso farcto; annulo nullo." "Allied to A. vaginatus, but without a distinct sheathing volva, and with the stem merely spongy within and not filled with delicate cottony fibres. In full-grown specimens there is only a slight mark showing where the edge of the pileus rested. It is allied to the veil-less species from the Himalayas. The name is intended to record the services which have been rendered to Mycology by many excellent illustrations and in other ways by Cecilia E. Berkeley." pileus from protolog: 76 - 102 mm wide, dingy yellow [at first —ed. ], at first semiellipsoid, then campanulate and obtuse; contents not recorded; margin sulcate; universal veil absent or present as thick mouse-colored flat patches or warts or as warts with an acute peak, when present more or less forming a dense covering of pileus. RET: based on exsiccatum of Perreau 475: 110 mm wide; margin striate (0.3R - 0.35R), nonappendiculate; universal veil paler than pileus surface in exsiccata, pallid at first, darkening with exposure and age (gray-brown to dark grayish brown with high points and ridges fuligineous to nearly black), as many warts, detersile, often leaving thin layer of detritus over much of pileipellis (observed microscopically in scalp section). lamellae from protolog: quite free, at length remote, thick, sometimes forked or anastomosing, with interstices venous; lamellulae abruptly truncate. free, becoming remote, ? ?, drying tan to orangish tan to brownish tan, sometimes forking or anastomosing, intervenose; lamellae truncate to subtruncate, ??. stipe from protolog: 102 × 19 mm, attenuated upwards, above silky, below squamulose from fragments of volva, transversely or obliquely rimose; contents spongy, with occasional cavities, "but by no means filled with floccose down"; exannulate; universal veil thick, mouse-colored, at length splitting irregularly "from slight prominence" at base of stem [i.e., leaving cupulate volva—ed. ], "by no means vaginate" [i.e., not saccate—ed.]. based on exsiccatum of Perreau 475: 160± × 15± mm, narrowing upward, with fuligineous "flame" or zebroid pattern on grayish brown ground; exannulate. columnella double click in markup mode to edit. odor/taste from protolog: Smell none. Taste sweet. pileipellis In E. W. Brown collection: 155 - 220 µm thick, completely gelatinized only at surface, with suprapellis colorless and partially gelatinized (60 - 110 µm thick), with subpellis having brown intracellular pigment and ungelatinized (65 - 130 µm thick); filamentous, undifferentiated hyphae 1.1 - 7.7 µm wide, branching, closely packed, subradially arranged, commonly crossing gelatinized region into universal veil; vascular hyphae pallid yellow to orangish yellow-brown 3.2 - 13.7 µm wide, branching, rather common to locally plentiful, occasionally complexly tanged in extended masses, with darker hyphae more tightly coiled and more frequently branching and with more irregular outline. In Perreau 475 (fully expanded specimen left on public display before thorough drying): 65 - 95 µm thick, completely gelatinized only at surface; filamentous, undifferentiated hyphae decolored for about two hyphal diameters from surface, otherwise orange to orange-brown in mass, 2.5± - 11.5 µm wide, with broader segments sometimes slightly inflated, densely packed vertically, horizontally somewhat interwoven with noticeable gaps, with common broad subradial fascicles appearing to have once been adjacent but separated (probably by expansion); vascular hyphae 4.6 - 13.3 µm wide, orange to orange-brown to pallid yellow, branching, sinuous, common to plentiful, locally densely coiled and tangled, sometimes lying just below pileipellis and penetrating it occasionally, sometimes crossing from pileipellis into universal veil. lamella trama bilateral; wcs = ?? µm; filamentous, undifferentiated hyphae 2.8 - 5.9 µm, branching, sometimes constricted at septa, plentiful; vascular hyphae 2.8 - 23 µm wide, branching, locally rather common, locally tangled, rarely fasciculate; central stratum comprising tangled filamentous, undifferentiated hyphae with occasion slightly inflated intercalary segments up to 10.3 µm wide; subhymenial base comprising mixture of chains of elongate intercalary inflated cells (up to 74 × 16.7 µm, fusiform to broadly fusiform to subellipsoid, plentiful to dominating) and plentiful uninflated hyphae. subhymenium wst-near = 15 - 35 µm; wst-far = 50 - 70 µm; densely branching structure comprising short uninflated hyphal segments, partially inflated cells, and occasional inflated cells, in two± layers below bases of largest basidia and with three± layers between bases of longest basidia and bases of smallest subadjacent basidioles, with outermost cells of subhymenial base giving rise to two subhymenial cells or one cell perpendicular to central stratum. universal veil On pileus: all elements in upper part of wart tending to partially gelatinize, then becoming red-brown in mass; filamentous, undifferentiated hyphae 1.1 - 11.7 µm wide, with walls thin or up to 0.5 µm thick, branching, common, colorless or yellowish with subrefractive walls, sometimes with guttulate material on inside of cell wall, sometimes constricted at septa, dominantly single, infrequently in narrow fascicles, without dominant orientation; inflated cells dominating, colorless to grayish or brownish, globose to subglobose to pyriform (up to 39 × 37 µm in Perreau 475, up to 60 × 50 µm in type per notes of C. Bas in type packet) or ellipsoid to subclavate (up to 57 × 38 µm), with walls thin or up to 1.5 µm thick (most clearly seen in colorless cells), terminal singly and in chains of up to 3 cells; vascular hyphae not observed; clamps not observed. On stipe base: ??. [100/5/4] (9.5-) 10.3 - 14.9 (-25) × (8.6-) 9.5 - 14.3 (-25) µm, (L = 11.6 - 12.6 µm; L’ = 12.1 µm; W = 10.9 - 11.9 µm; W’ = 11.3 µm; Q = (1.0-) 1.03 - 1.13 (-1.36); Q = 1.05 - 1.08; Q’ = 1.07), hyaline, colorless, inamyloid, thin-walled, smooth, globose to subglobose, infrequently broadly ellipsoid, adaxially flattened; apiculus sublateral, often proportionately small, cylindric; contents granular to mono- or multiguttulate, some collections dominantly monoguttulate; ?? in deposit. ecology from protolog: "On the ground in woods." RET: U.K.: "in woods." France: "forêt." material examined from protolog: U.K.: ENGLAND—? ?, King's Cliffe, "Aug.-Sept." C. Broome(?) s.n. (holotype, K). FRANCE: ÎLE DE FRANCE—no. loc., x.1975 participant in Salon du Champignon s.n. [J. Perreau 475] (PC). U.K.: ENGLAND—Northamptonshire - unkn. loc., s.d. M. J. Berkeley s.n. (PC). Surrey - Chessington, S of London, Horton Woods, 27.viii.1997 Geoffrey Kibby s.n. (RET 270-2). WALES—Dyfed, Middleton, 20.ix.1994 E. W. Brown s.n. (RET 270-1). Notes of C. Bas with type in K (King’s Cliffe, ix.1852 no coll. s.n.) give dimensions of spores as [10/1/1] 10.5 - 15.5 × 10.5 - 15.3 µm. In an accompanying collection from the type locality without other data (possibly an isotype per C. Bas’ notes), Bas recorded spores as follows: [11/1/1] (11-) 12.5 - 16 (-21) × (11-) 12 - 15.5 (-20) µm. I approximate the Q values for these two sets of measurements as 1.01 and 1.04.